Well. This is different. 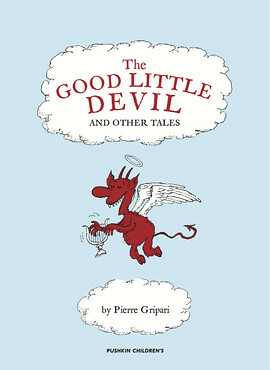 The Good Little Devil and other tales, by Pierre Gripari, which is part of Pushkin’s new translated children’s books, is both similar to the traditional tales we’ve ‘always’ had, as well as rather different. I enjoyed them a lot, and I think any child my age would. It’s the kind of thing we used to read. Except different. As I said. I would like to think that children today would also love them. But they are just that bit different from what English-speaking children are used to, and they do feel quite French, somehow. The cover is quite charming, featuring the devil who is so good he becomes an angel in the end. Fun as that story is, I found most of the others better still. Many of them are set in or near a fictional (maybe) street in Paris, and have members of the same family turn up over and over again. It’s quite nice seeing the same people like this, because it gives more depth to what they are like. As well as these reasonably normal people, we have the standard kings with beautiful daughters, and fathers with three sons. You know the drill. They are just that little bit not the same as our old stories (trying to avoid using the word different yet again). This entry was posted in Authors, Books, Fairy tales, Languages, Picture book, Reading, Review and tagged Pierre Gripari, Puig Rosado, Sophie Lewis. Bookmark the permalink.